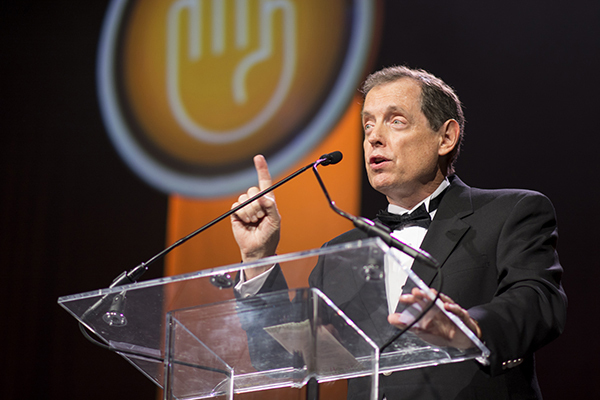 On November 15, 2014, Mike Anglin received the Kuchling Humanitarian Award from the Dallas Black Tie Dinner, annually the largest annual fundraising event in the City of Dallas. The following is the written text of his acceptance speech that evening before an audience of 3,300 guests. When I presented this award to the great Bill Nelson at the Black Tie Dinner of 1986, he came up to the stage, I handed him the plaque, he leaned into the microphone, said, “Thank you,” and then humbly returned to his table. Well, as you probably know, since then, it has become traditional that the recipient offer a few words before leaving the stage. So, I was thinking … I don’t really know that I have any great wisdom to impart to anyone tonight ... I mean, you already know that the importance of a good moisturizer cannot be overstated . But I did come across something not long ago that sort of rang true to me, and I thought I’d share that with you tonight. Well, I was lucky enough to be there in that “golden moment of experience” when we created the Black Tie Dinner one weekend evening in the spring of 1982. That was over 32 years ago ... and now that those years have all slipped away (and don’t they go by in a blink) ... and I’m standing here just barely able to still claim to be in my MID-60’s ... I guess I’m old enough to be struck by remembrance at these events now. - - - and without whom, I realize, I would not be standing here now. So, since it was not given to us to know what life would have been like, had they, too, lived into older age (and I have to tell you, I often wonder what life would have been like if they had) ... it at least gives me great pleasure to accept this recognition in their names, too: my forever-young comrades in our great quest (during the middle part of my life) for the big issues ... for the truth, for social justice and for equality under the law. And if there’s anything bigger than that, I don’t know what it is. These were true civil rights activists! … whose only enemies were arrogance, ignorance and dogma. Activists whom I had the good fortune to be associated with in those years ... to fall under their inspiration ... to be drawn into the wonderful energy of their absolute commitment to the health, safety and welfare of this community . . . and of their hopeful vision of the possibility of a brighter future for us all. For the wonderful young people in this audience tonight … how I wish you could have known them: Bill Nelson, Terry Tebedo, John Thomas, Ray Kuchling, Don Baker, Howie Daire, Don McCleary, Mike Richards, Robert Schwab and Tom Stoddard . . . and so many others. - - often filled with vision and hope and courage ... and sometimes cast down by uncertainty ... and the fear of a dreaded virus named HIV. Who would be next? We never knew. We had to learn to be tireless and fearless. We had to learn the difference between that which matters, and that which only seems to matter ... the hardest question in life. We had to learn that when life is driving you crazy … devote yourself to others; it will drive you sane. We had to learn to become care-givers for our friends, and to burry our sorrows ... and then somehow pick up the pieces ... and move on. We had to learn to draw chalk outlines of fallen bodies on the pavement of a city plaza. And we had to learn to wish each other well …. and to forgive. And we had to learn to never, never give up. And now that my generation is reaching its older age ... we are still learning. But this time, we’re learning to remember. And that’s what the new organization The Dallas Way is all about, and why that is so important to me now. So, if those "angels unaware” are looking down on us tonight - - Bill & Terry, John, Ray, Don, Howie - - and all the rest, I would only want them to know that we do remember them ... and that we can still feel the legacy of their hopes and strivings, despite it all, for “happier days ahead” ... happier days which, by the way, did eventually come ... better days that have come . . . and that are yet to come. So, what would I say to them tonight, if only I could?